Observation of homelessness. Homelessness is worldwide, multi-cultural, and a contingent problem for governments, states, and cities. How can we as a people make this go away? There is noncompliance in many homeless cases. Transients, panhandlers, and homeless individuals move from state to state or city to city, without addressing their problems or seeking personalized treatment and help. Without a commitment from these individuals to comply, assistance is useless. Many of the churches, ministries, and various organizations are doing their part. I look to the President, governors, senators, and mayors for help. They seem to be more focused on keeping a certain minority out of America than dealing with the longstanding issues of American poverty, mental health, drug abuse, and homelessness. I have a real problem with building a wall to keep out immigrants–like they don’t know how to climb. The money it’s costing to fund this wall could be put to better use to create a homeless foundation. 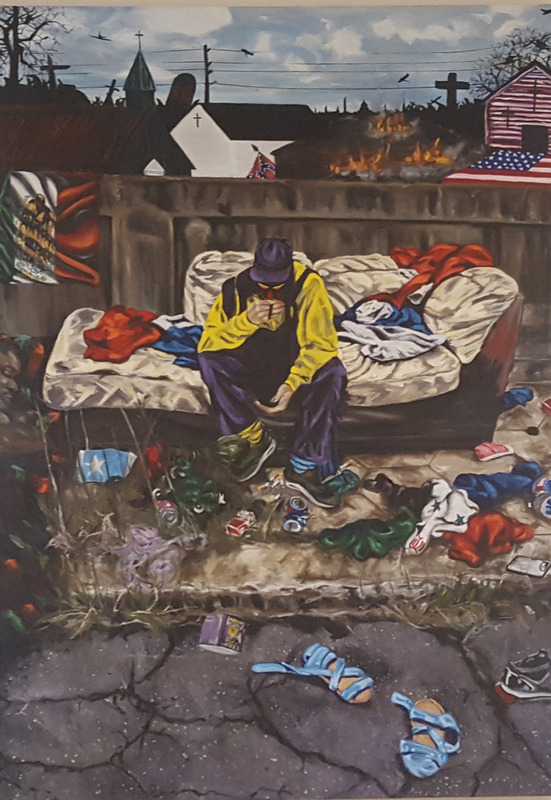 The narrative-based composition shown here, titled Homelessness, was a large-scale painting encompassing all of the feelings that came to my mind about this epidemic.